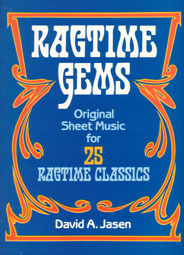 >Sheet Music reprints of first or early editions of 25 piano rags from 1904 through 1911. Included is the famous "Dill Pickles" by Charles L. Johnson along with rags by Scott Joplin, Henry Lodge, and others. PUBLIC DOMAIN STATUS: All selections are reprints of original or early editions with copyright date and publisher shown. All are believed to be in the public domain in the United States. Public domain status may not apply in countries outside of the United States where copyright protection may exist.